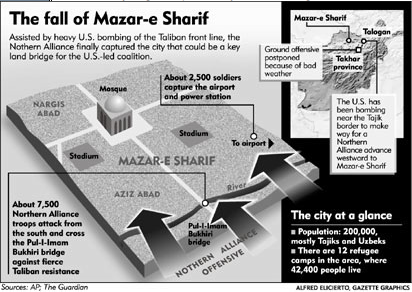 In response to the September 11, 2001 terrorist attacks in New York City and Washington, D.C., U.S. President George W. Bush launched a massive attack on Taliban positions in Afghanistan, effectively starting a war that predated, and has outlasted, the war in Iraq. At the time, I was Graphics Editor of a skeleton news graphics outfit in The Gazette, the proud and feisty English-language broadsheet in Montreal, the heart of French Canada. 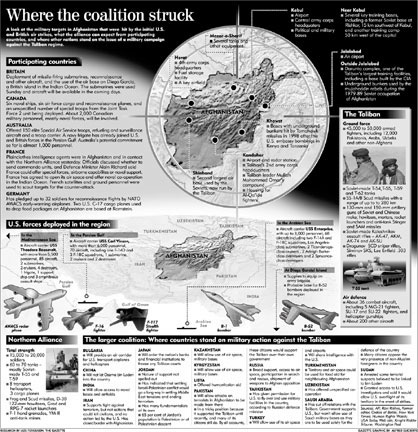 Because The Gazette subscribed to AP and KRT graphics, it was easy to assume that, with the help of syndicated graphics, the paper would have very visual, graphics-driven pages in our coverage of the war. AP and KRT graphics were usually too little, too late. 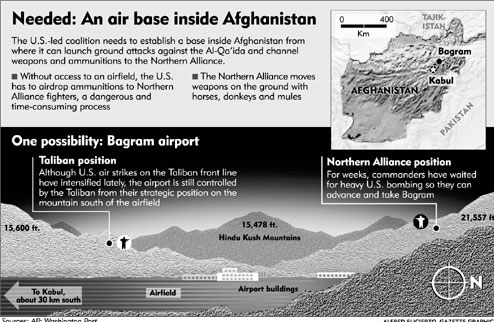 Ray Beauchemin, our foreign editor, and I found out that even if we planned our Afghanistan pages early in the day as we tracked how the stories were developing, we could not depend on syndicated graphics from AP and KRT. That meant we — or rather, I — would have to create and produce the graphics myself. 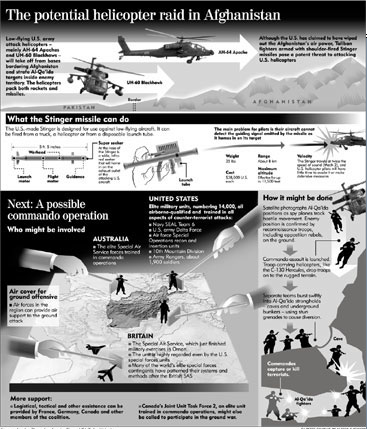 So I did what had to be done — track the Afghanistan stories early in the morning to determine where they were going in terms of their possible graphic requirements. After the morning story meeting, I would usually know what graphic might carry the page for the day. I would dive into my research, scour the usual and unusual sources for facts and visual references and grab anything that might be of help. Before lunch, I would have a sketch going on with bits and pieces of facts, many of which had to be tied together, checked and double-checked for accuracy. Ray and I would regroup before 3 p.m., take stock of what we have and firm up our plan. By then I would have a graphic in its finishing stage. In nine out of ten cases, the unfinished graphic that I would show the editors during the afternoon story meeting would be the one to appear in the next day’s paper. But in the rare case that a story swung in a new direction or changed totally, I had to come up with a quick alternative, a Plan B that’s been warming the bench. And here’s where experience and mastery of the subject comes very handy. An experienced practitioner of this trade stays cool and steady amid changes that are normal in any newsroom — and under deadline pressure. As soon as it is established that the visual approach is going in a different direction, training takes over and gets the job done.